This course reviews information on how to purchase, store and prepare food in a safe manner to will reduce the risk of food borne illness. Food Safety: How to handle, thaw, cook and store food correctly to reduce the risk of food borne illness. Food Quality: How to select, transport and store food properly to retain its quality. Food Longevity: Guidance on how long food will remain palatable when stored in different environments such shelf, refrigerator and freezer. A guide to preventing, identifying and treating numerous foodborne illnesses is included. The 41 page “A to Z” guide for selecting and storing over 75 fruits and vegetables increases the value of this book. Define and understand product-dating and grading guidelines. Apply principles for safe food purchasing and storing perishable and nonperishable food. Verbalize techniques to reduce food waste and keep food fresh longer. Describe safe food preparation and serving practices to prevent food borne illness. Explain at least 3 food hazards and how they could occur. Demonstrate methods for sanitizing and cleaning sinks and countertops. Define safe cooking methods for a variety of food types. Recognize foods to avoid when pregnant. Understand baby food do’s and don’ts. Identify safe food storage practices for left-over food. Apply techniques to safely prepare and serve holiday meals. Explain how to identify, prevent and treat of food borne illness. Understand the difference between foodborne illness and gastroenteritis. Recognize the common types and causes of foodborne illness. 7.2.11 Applies knowledge of hygienic food preparation practices and causes of foodborne illness in food preparation. 8.4.3 Uses a variety of cooking techniques, food preparation and production and delivery systems. This course is also approved by the Certifying Board of Dietary Managers (CBDM). Mark Tamplin: Internationally recognized for research in pathogen ecology and virulence, Mark Tamplin’s career has encompassed research at the US Food & Drug Administration, University of Florida, and the US Department of Agriculture-Agricultural Research Service. He currently works in Australia and the USA. Over his career, he has advised the World Health Organization, the United Nations Food & the United Nations Food & Agricultural Organization, and the US Centers for Disease Control & Prevention. Mark Tamplin has published highly cited research in more than 100 journal articles and a dozen books, and has been interviewed by influential media—such as CNN, NBC Radio and The Washington Post. Numerous honors include appointment by the US Secretary of Agriculture to the National Advisory Committee on Microbiological Criteria for Foods. Mark is co-founder of the on-line database, ComBase. Joe Kivett: Joe Kivett received a BA in speech communications and a BS in broadcast journalism from the University of Florida, and lives in downtown Orlando with his wife and daughter. They enjoy cycling, hiking and, of course, grocery shopping together. Dr. Gerald Kivett: Discovering a passion for teaching and an interest in the medical field, Dr. Kivett received his Doctor of Medicine degree from the University of Florida. Following six years of employment at two Naval Hospitals, he left active duty in the Navy and started his private practice in Orlando in 1984. Educating his patients on a healthy lifestyle is an important aspect of his practice. 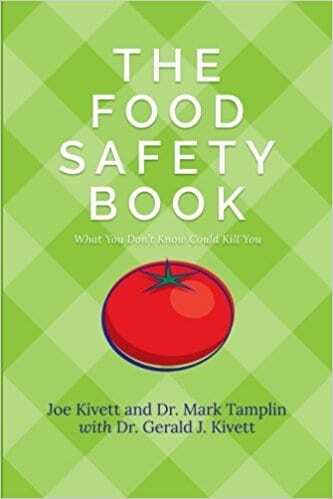 Having seen a great number of food poisoning cases that could have been avoided with basic proper food safety knowledge, Dr. Kivett was pleased to write the chapter on foodborne illness in his son’s first published book, THE FOOD SAFETY BOOK. Dr. Kivett continues to stamp out disease as a family practice doctor in Orlando today.